A new survey of bank executives indicates that the competition for talented employees is likely to continue in the near term. At the same time, though, there are signs that the demand for employees could be starting to ease slightly, and some banks could be preparing to adjust their talent management strategies in response. Every year, Crowe Horwath LLP surveys financial services companies throughout the United States about compensation trends, benefits, incentives, and other human resources issues. The responses to the 2017 survey show that employee salaries and turnover rates still are rising, continuing a multiyear trend. Yet while overall staffing levels are still increasing, some of the underlying factors that drive the competition might be starting to shift, and banks should be prepared to adapt their approaches in the coming years. Business growth and staffing plans. 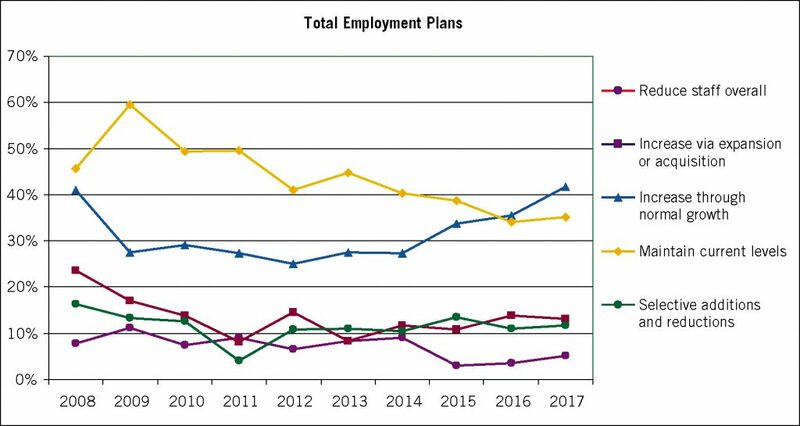 One of the most striking trends in the 2017 Crowe survey relates to banks’ overall employment strategies (see graph 1). For the first time since the 2008-09 recession, more than half (54.9 percent) of the survey respondents reported they planned to increase staffing levels during the coming year, either in response to normal growth (41.7 percent) or as a result of expansions or acquisitions (13.2 percent). Moreover, the number of banks that planned to increase staffing levels solely in response to normal growth shot up sharply in 2017, significantly surpassing the number that planned to maintain current levels. Those positions had been reversed for more than 10 years, before the two numbers became roughly equal in 2016. The 2017 results suggest employment growth is now the dominant expectation among survey participants. Turnover rates and compensation strategies. As more banks plan to increase total employment, other factors—particularly rising employee turnover rates—are adding further upward pressure on salaries. Average employee turnover rates among both officers and nonofficers climbed for the third consecutive year in 2017, reaching their highest levels in more than a decade—7.3 percent average turnover for officers and 18.9 percent for nonofficers (see graph 2). 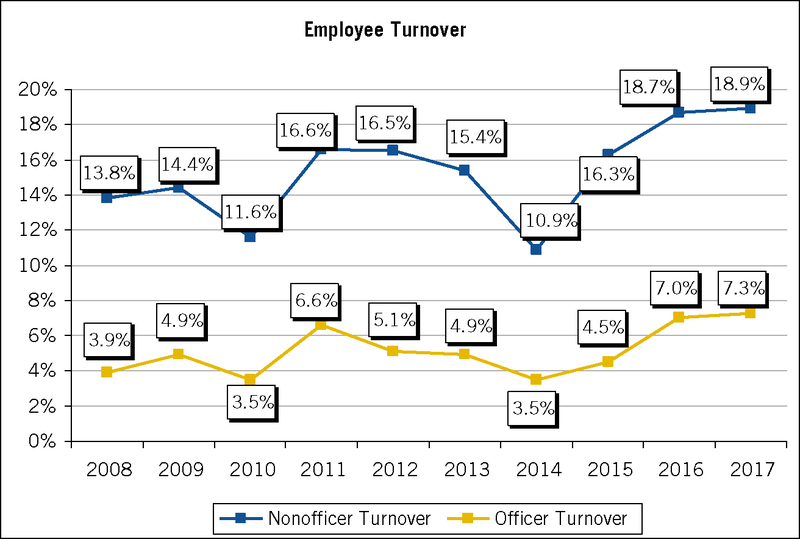 It is worth noting, however, that while reported turnover levels were slightly higher in the 2017 survey, the rate of increase was noticeably more modest than in the previous two years. This could be interpreted as a sign that the labor market is beginning to stabilize to some extent. This impression is reinforced by the results of another survey question, in which participants were asked to compared their compensation strategies to those of their competitors. 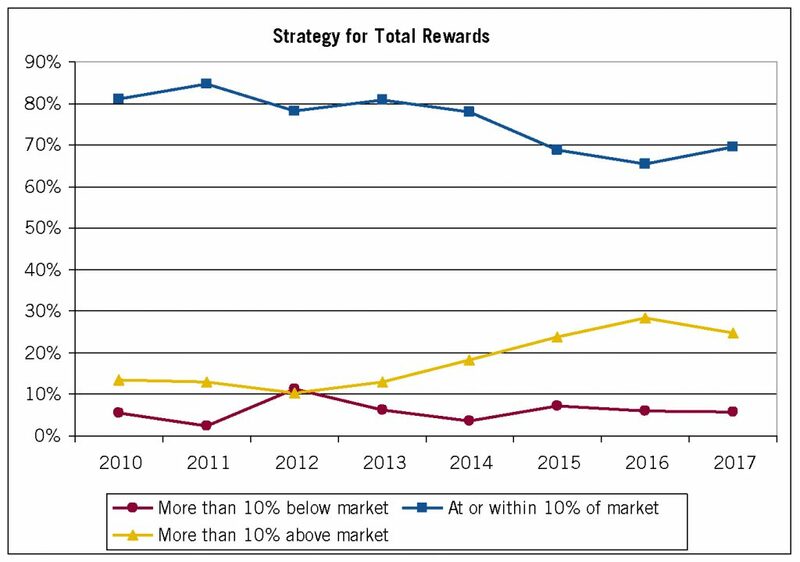 Specifically, the survey asked them to characterize their total rewards packages—that is, the combination of salary, benefits, bonuses, and other incentives—and rate them as being more than 10 percent above the market average, at or within 10 percent of the market average, or more than 10 percent below the market average (see graph 3). In the 2017 survey, the number of banks that reported using an above-market compensation strategy declined slightly, while the number that planned to stay near the market average increased by almost the same amount. This reversed what had been a strong four-year trend and could be seen as another indicator that bank executives are sensing a stabilizing labor market. Pay and performance. One of the most obvious measures of the heat of the labor market is salary increases. Here again, the 2017 survey results seem to suggest that the competition for talent is continuing, but possibly moderating. Average annual salary increases for both officers and nonofficers have been on a general upward trend since the depths of the recession. In addition, the actual salary increases typically matched the survey respondents’ projections fairly closely from 2011 through 2015 (see graph 4). In 2016, however, actual average salary increases spiked rather sharply, exceeding survey projections noticeably as the battle for talent intensified. In 2017 that trend moderated somewhat. While average salary increases in 2017 were still higher than 2016, they once again were very close to respondents’ expectations. The upward pressure on salaries is seen in the C-suite as well. According to the survey, total compensation packages for top bank executives have risen noticeably over the past five years, led by a particularly sharp jump in CEO pay from 2016 to 2017. It should be noted, however, that at least some of the one-year increase in reported CEO pay could be attributed to changes in the survey population from one year to the next. In this instance, what is more revealing than the specific year-to-year changes is the contrasting direction of the changes across various executive positions. While the salaries for most top bank executives have risen over the past five years, several positions—top retail banking officer, chief information officer, and chief human resources officer—have moved in the opposite direction. These contrasting trends suggest that boards of directors are placing greater value on executives who play strategic roles in managing risk and credit exposure or in growing their banks’ lending portfolios, while placing less value on retail banking and essential administrative functions. It also is interesting to note that the effects of recent regulatory and disclosure requirements related to top executive pay are not readily apparent in the survey data. This is most likely due to a lack of clarity regarding how—or even whether—some of these requirements ultimately will be implemented. As those issues are resolved in the coming months, many banks are likely to revisit their compensation strategies, factoring in both the changing regulatory environment and the evolving trends disclosed by this survey and other sources. When they do, they are likely to find that, while the war for talent is still continuing, there are signs that strategies could be starting to shift. Timothy J. Reimink is a managing director and Patrick Cole is a senior manager at Crowe Horwath LLP, which is endorsed by ABA for risk management consulting services.